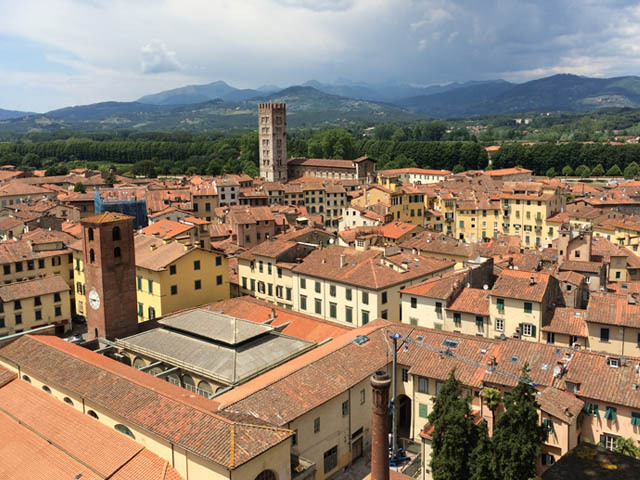 How to fall in love with the charming walled town of Lucca! Being an enthusiastic Italian language student, who is oh-so-susceptible to the irresistible charms of Italy, I find myself traveling again and again nel bel Paese. I can’t help myself! I go crazy for the Caravaggios, the rustic earth toned buildings, the juicy red tomatoes, the creamy pastas, the hearty chiantis, as well as the chiming bells and the cheerful multicolored ceramics. I love all the things that make Italy, well, Italy! 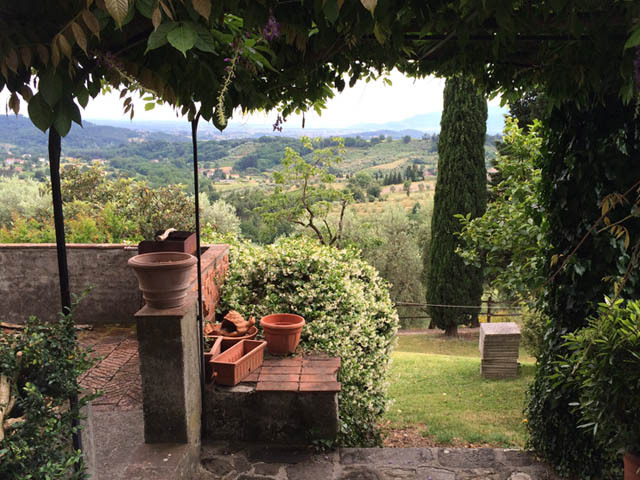 But, I have to say that some of my most memorable moments I have spent in Italia have been the times when I am in a bar sipping a cappuccino, or in an out door caffè or enjoying a glass of wine chatting with local folks in their own language. In this way I have made many friendships and my travel experiences in Italy are more meaningful. Having traveled up and down the Italian boot from Milano to Lecce, I find Italy to be a warm and friendly place and it isn’t hard to engage the locals in a conversation. 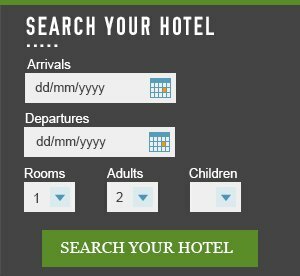 And yet, there is a small town I have discovered, that simply exudes historic charm and where the people are especially delightful and willing to help you with your Italian. 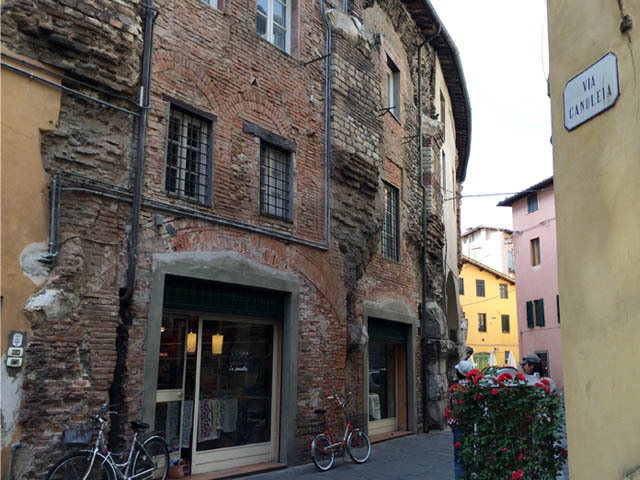 I am talking about the lovely Tuscan town of Lucca! 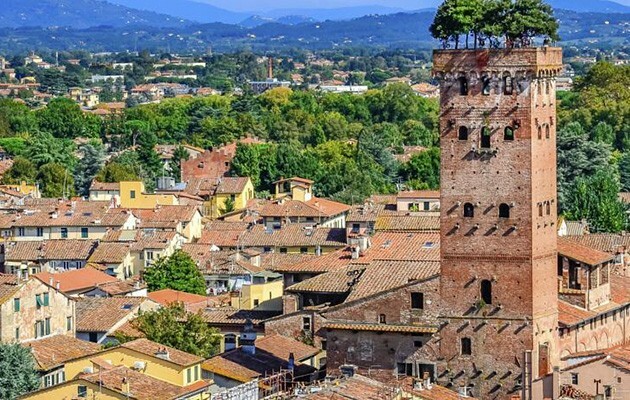 Lucca, just an hour west of Florence and only twenty minutes by train from Pisa, embraces you immediately with her medieval walls & tree lined paths. She draws you in the moment you pass through one of her impressive portals and you immediately feel safe and at home. Originally the city was built by the Etruscans and later inhabited by the Romans. 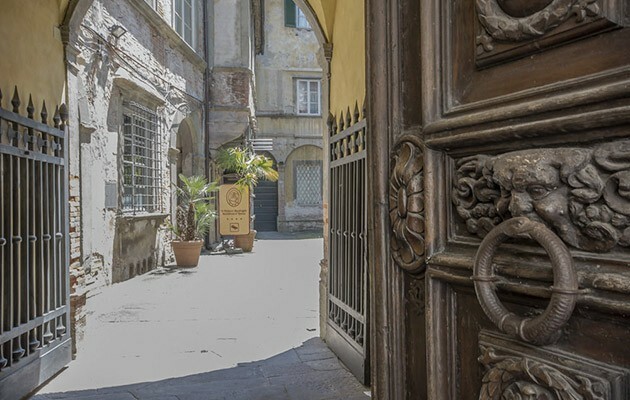 As you wander from Piazza S. Michele, built in the spot of the original Roman Foro, to stroll down via Fillungo now popular for it’s shopping, ancient history is revealed in the very stones of Lucca. This is no more evident than in the curvature of the walls of Piazza dell’Anfiteatro. Once home to Roman games, now it is a social gathering spot, popular for its music festivals and where some of the city’s best spritzs and shakeratos are served. Restaurants are plentiful in Lucca and you won’t want to miss tasting a bowl of “farro” / barley soup or a plate of Lucchessi tortellini served with a rich meat sauce. Lucca is also well known for its “sformati” or vegetable pies and of course its “Buccellato”, a typical sweet cake filled with raisins and aniseed, that is only made in this medieval town. Lucca is less touristy and certainly less crowded than Florence. As a result you will have a more authentic experience visiting the town that is the historic birthplace of composer Giacomo Puccini. It is also home to several Romanesque churches - San Martino and San Michele, similar in style to Pisa’s iconic Duomo and bell tower. 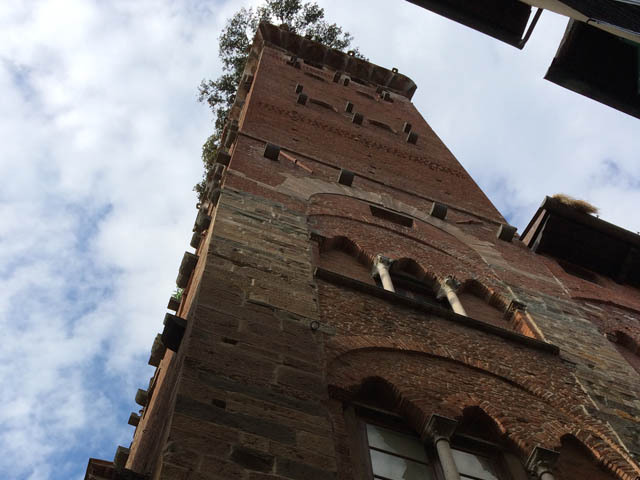 Climbing la torre Guinigi, the tallest medieval tower in Lucca (and the only one with trees growing out of its top) you will have a spectacular bird’s eye view of the city and the Garfagnana, the mountains to the north of Lucca. 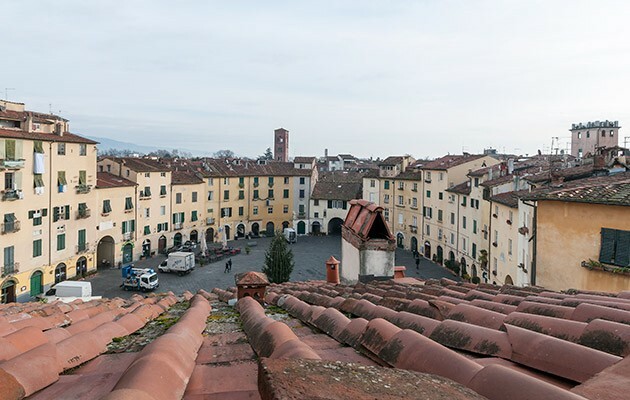 But, the thing that makes Lucca incredibly unique are the walls that encircle the city. Originally built by the Romans, they were later enlarged and fortified with great mounds of earth in the 1500’s to fend off attacks by the Medicis of Florence. The walls never saw battle and were demilitarized by Napoleon. In the 18th century Louisa Bourbon, with the help of her royal architect, turned the walls into magnificent tree lined boulevard. Today it is a playground for the Lucchesi and a perfect place to go for a jog, walk a dog or pedal a bike. It is also a relaxing place to sit on a park bench and listen to Italian conversation flow all around you as you bask in the glow of a perfect Tuscan afternoon... and fall in love with the charming walled town of Lucca! Melissa Muldoon is an American and the woman behind the STUDENTESSA MATTA ITALIAN LANGUAGE LEARNING INITIATIVE. Having self taught herself the Italian language, she now promotes the study of the Italian Language & Culture through her blog site as well as through Italian Language Immersion trips in Italy. She writes the Studentessa Matta blog in Italian & English to exercise & flex language skills. The blog explores various aspects of Italian culture & current events in a light and humorous way, as well as features language learning tips, websites, videos & articles that are helpful to obtaining fluency. She also produces the podcast “Tutti Matti per l’Italiano” which feature clips of native Italian speakers. She has a Masters in Art History and is also a graphic designer. 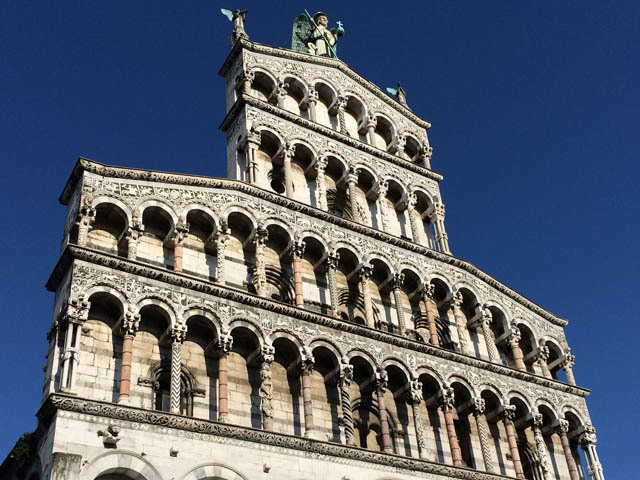 Melissa has just returned from Lucca where she spent eleven days immersing in language & culture with a group she organized with Lucca Italian School. 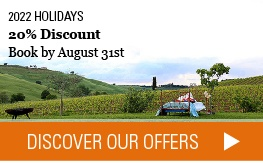 The Matta Immersion program in Lucca will be repeated in September 2015 (11-22). Visit www.studentessamatta.com for details. Andiamo a Lucca! If you have any question for Melissa, post a comment and follow her on Facebook & Twitter!